As a pastor for almost 30 years I’ve experienced corporate, individual, internal, and external spiritual warfare of various kinds. Spiritual warfare is a lot like a military battle nations face with its weapons and surprises that are unpredictable, and the attacks of the enemy often come when you least expect the enemy to show up. Over the years I’ve read books that see a demon behind every bad thing that happens in life (the extreme of demonic awareness) to those who say that Satan and his demons are totally bound today (no presence of the demonic). Borgman and Ventura have written a book that really does what they say they are going to do in the subtitle: strike a biblical and balanced perspective. The authors have written a solid exposition based on the most extensive account on spiritual warfare in the Scriptures: Ephesians 6:10-20. The Puritan William Gurnall wrote the classic text on this passage a few hundred years ago, but it’s massiveness and ancient language makes it a popular but widely unread book on the subject. On the other hand, this book is short (128) pages, comprehensive, clear, illustrative, practical, insightful, theological, and focuses on the Majesty and Supremacy of Christ over the demonic realm. I now have a new go to book to give to people who have questions about Satan and demons and how they operate today in the 21st century. Questions like How can I prepare myself for the spiritual battle? How can I fend off the attacks of the demonic? Can a Christian be possessed or demonized? And many others. I like the fact that the authors stick close to the text of Scripture and offer answers that are biblically sound and cogently articulated. 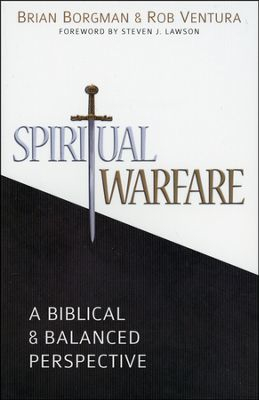 If you’re only going to read one book on spiritual warfare – this is the one I would recommend you get. I think one of the best features of this book are the questions for the discussion at the end of each chapter so that it can be used for a sermon/small group series on spiritual warfare. *I was provided a free copy of this book for review by the publishers and was not required to write a positive review.